Most people know by now that the United States has the highest corporate tax rate in the world. At 39.1 percent, it sits 14 percentage points higher than the OECD average. However, many will point to all the “loopholes” that narrow the corporate tax base and say: “sure, we have the highest statutory rate, but no company pays that!” The implication is of course that U.S. corporations don’t pay a high tax rate compared internationally. Contrary to this claim, studies show that not only does the United States have the highest statutory rate, but one of the highest effective tax rates. Our 2011 study on effective corporate tax rates shows this. 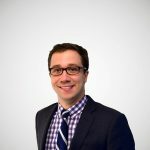 It reviews a number of recent studies and concludes that the average effective rate is around 27 percent, while the average around the world is 20 percent. Adding to these studies, PricewaterhouseCoopers released a new report that also finds the United States has one of the highest effective corporate tax rates in the world. Looking at six different industries (Automotive, Aerospace and Defense, Chemicals, Engineering and Construction, Industrial Manufacturing and Metals, and Transportation and Logistics), the study found that U.S. corporations face an average effective corporate tax rate of 30.9 percent in 2012. 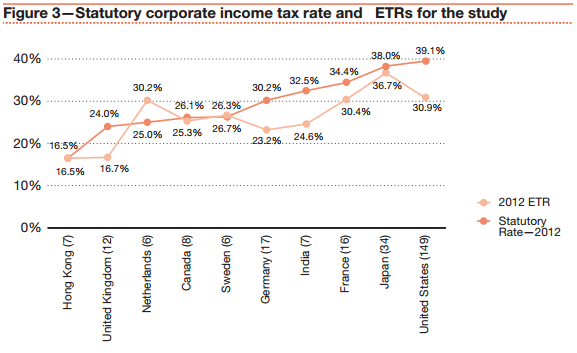 The only country whose corporations face a higher effective tax rate in the study was Japan at 36.7 percent. The lowest effective tax rates were in the United Kingdom and Hong Kong which had ETR of 16.7 percent and 16.5 percent, respectively. The average effective tax rate in the study was 28.3 percent in 2012. Although this study looks at a narrow set of industries and countries, it still shed light on the tax burden of U.S. corporations compared internationally. The growing discussion over corporate tax reform, and the recent Senate hearing over Apple, underscores the importance of understanding where the United States stands internationally. Anecdotes about individual companies paying very little corporate income tax tells us little about the overall competitiveness of the U.S. corporate tax system. With this study and many others, there is no doubt that the U.S. imposes a high tax burden on corporations, no matter how you measure it.